Oddly, one of the most exciting parts about watching any Marvel movie comes after the credits hit the screen at the end. At this point, it has become an expected tradition for there to be at least one post-credit scene to play after the credits roll, letting filmgoers know about what next to expect. Typically, these scenes are used to tease upcoming sequels, hinting at a character or storyline that will soon come in a follow-up film. These are featured in many modern films, but the ones included at the end of Marvel movies are certainly the most exciting. Because Ruben Fleischer's Venom is not connected to the MCU, at least not right now, we won't be seeing Tom Holland's Spider-Man or any similar superheroes show up. But that doesn't mean Venom can't have some intriguing post-credit scenes of its own. The film itself won't be releasing in theaters until Oct. 5, but details about the two scenes shown after the credits have leaked online. Obviously, these can be considered major spoilers for anyone looking to be surprised, so if you don't want to know what happens, turn back now! Alright, on to the spoilers. The first post-credit scene will follow the events of Venom, setting up a sequel with a major supervillain played by a big star. Whatever happens in the story, Eddie Brock (Tom Hardy) will still be a journalist by the end of the film. Now pursuing new leads for a story, Brock travels to the famous San Quentin prison to interview a dangerous murderer. The killer in question is none other than Cletus Kasady, the man who becomes the infamous supervillain Carnage. Kasady, who's played by Woody Harrelson in a red-haired wig, asks Brock if he "wants to hear the carnage," referring to his murders. Obviously, name-dropping his alter ego makes it clear who this character is intended to be, for those unfamiliar with the Cletus Kasady name. 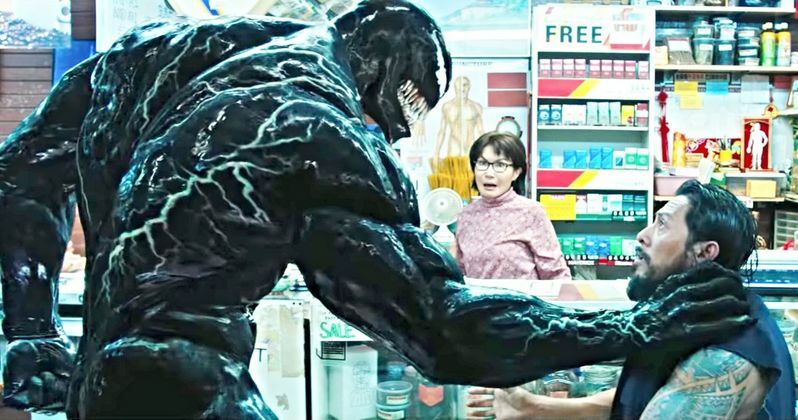 During their conversation, a piece of the Venom symbiote can be seen lurking its way towards the serial killer, before the scene cuts to black. Clearly, what's being set up is a confrontation between Venom and Carnage in a sequel, and we're already being given an explanation as to how Carnage comes to be in this universe. With there still being uncertainty as to whether we'll ever see Spidey show up in a Venom sequel, Carnage seems like the obvious go-to for Eddie Brock's next foe. The second post-credit scene does not involve Venom, but rather teases another upcoming Marvel movie. This December, the animated Spider-Man: Into the Spider-Verse will be hitting the big screen, and a sneak peek at the film will be shown after the Venom credits finish rolling. It will be introduced with a message reading, "Meanwhile, in another Spider-Verse..." before showing footage from the compelling new movie. Venom will be releasing in theaters on Oct. 5, 2018, while Spider-Man: Into the Spider-Verse will premiere on Dec. 14, 2018. This information comes to us courtesy of Looper.